BANGI, 1 Oct 2013 – The National University of Malaysia (UKM) has again won the ASEAN Energy Award for this year, the fourth time since its inception in 2001. UKM won the award organised by the ASEAN Centre for Energy (CACE) under the ASEAN Renewable Energy Project Competition (Special Submission Category) for the Solar Assisted Hot Water Heating System set up at the UKM Medical Centre. 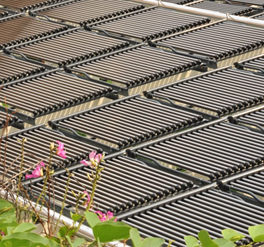 It is the largest solar hot water system in Malaysia. The award was presented by Mr Daniel B. Poneman, Deputy Secretary of Energy, US Department of Energy; one of the ASEAN dialogue partners during the 31st ASEAN Ministers of Energy Meeting in Bali, Indonesia on Sept 25. Director of UKM Solar Energy Research Institute (SERI), Prof Dato’ Dr Kamaruzzaman Sopian and Prof Dr Syed Zulkifli Syed Zakaria of UKM Medical Centre (UKMMC) received the award on behalf of UKM. Khalid Mokhtar, CEO of Zamatel Sdn Bhd, UKM’s industrial collaborator for the solar hot water heating system was also present at the ceremony. Prof Kamaruzzaman, in a statement to UKM News Portal last night, said with this year’s award, UKM has become the first university to win the award for four times since its inception in 2001. The annual competition is to recognise outstanding works in the areas of renewable energy development comprising of hydro, wind, biomass, geothermal and solar as well as best practices that contribute to energy efficiency in the region. The first ASEAN Energy Award won by UKM was for its Thermal Storage for the UKM Air Conditioning System. The second was for the Solar Hydrogen Eco House and the third for the Portable Power Fuel System. 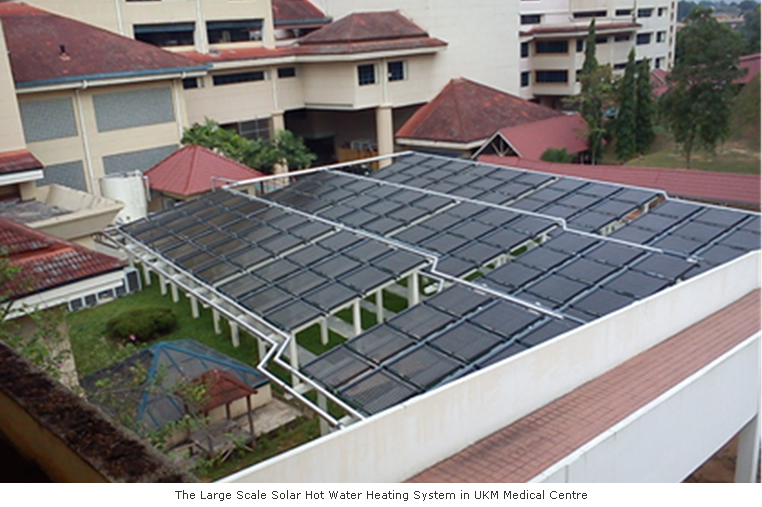 The large scale solar assisted hot water heating system was installed at UKM Medical Centre (UKMMC) by SERI and Zamatel with a funding of RM2 million under the Technofund scheme of the Ministry of Science, Technology and Innovation. He said the system has a life span of about 15 years with a payback period of just 2.9 years. Prof Kamaruzzaman said a team from SERI, UKMMC and Zamatel Sdn Bhd designed, installed and commissioned the system. The design has since been copyrighted under the name i-PANAZ ©. With over 200 hospitals and big hotels in the country all their hot water heating systems could easily be converted to a solar assisted system. The conversion can generate a business opportunity of RM180 million being the total estimated cost of conversion. Prof Kamaruzzaman said conversion to the solar system for all hospitals and hotels in the country can lead to an emission reduction of 42,000,000 kg CO2 and 33,000 kg nitrogen oxide per year. This will help Malaysia’s ambitious target of reducing its carbon emission by 40% in 2020, he said. Prof Syed Zulkifli said “the water heating units in most large hospitals run 24 hours a day using LPG as the fuel for the boilers. Hospitals utilize over 30% of their total energy consumption for water heating. Khalid said there are over 400 large hospitals and hotels throughout the ASEAN region that can benefit from the system. The potential market size for ASEAN would amount to RM360 million (USD120 million) for 400 hospitals and hotels alone. The integration of the solar system can easily replicate the existing LPG boiler systems of the hospitals and hotels providing a savings potential of almost RM196 million (USD65 million)”. Prof Kamaruzzaman said other promising applications of i-PANAZ © are solar industrial process heat in textile factories, food processing industries, animal husbandry, dairy, aquaculture and swimming pool heating.